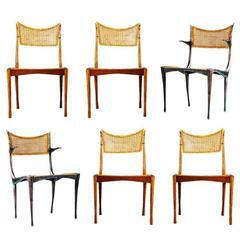 Dan Johnson Viscount chairs A set of 6 iconic "Viscount" chairs designed by Dan Johnson. Recently restored in a luxurious apple green Sandra Jordan Alpaca fabric with contrast ivory trim. The frames have been bleached with natural brass details. Denmark, circa 1950s. 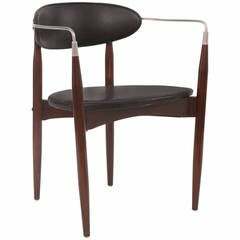 A side chair by Joaquim Tenreiro. Original upholstery and stiletto legs of Brazilian mahogany. Chic and sophisticated design, wood and cast aluminium frames, black vinyl upholstered seats and backs. Two available, priced and offered individually. 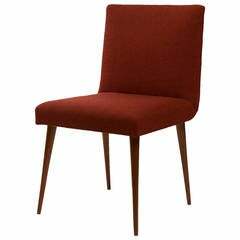 Paul Frankl single side dining or desk chair for Johnson Furniture Co. In original finish and upholstery, from one owner estate.